The Rhinoceros hornbill is a large, cavity-nesting bird with black plumage, a white abdomen, and a long white tail crossed by a wide black band. Named for the upturned casque or “horn” that sits atop their giant colorful beaks, the males and females look alike except for their eye color (M-red, F-white). Hornbills’ diets include mostly fruits, and occasionally insects, small animals, and birds. They eat by picking up their food with their long beak, throwing their head back, and swallowing it. Rhinoceros hornbills need large trees to nest and feed. You’ll find them living in the thick, lowland hill forests of Indonesia, Brunei, Malaysia, Thailand. After the female lays 1-2 eggs, the pair uses mud and fruit to seal the female inside the tree cavity. The male passes food to her through a tiny hole while the female sits on the eggs. Thirty days after the chicks hatch, the female breaks out of the cavity and reseals the entrance. The chicks remain in the nest until they are about 80 days old. 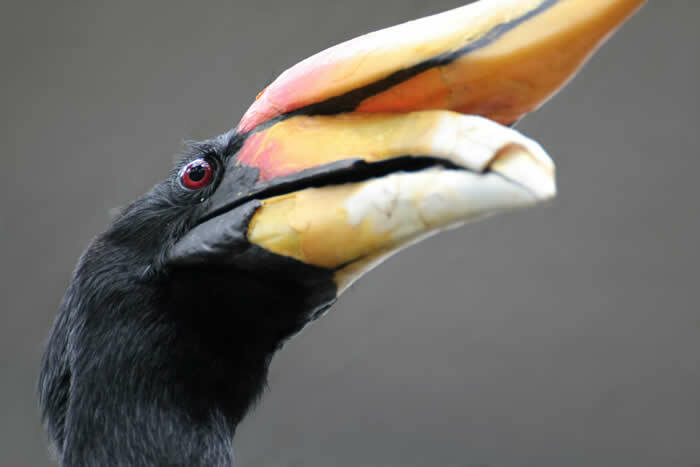 he rhinoceros hornbills are currently decreasing in number, but are not yet endangered. The continued loss of habitat could threaten wild populations in the future. The 54 species of hornbill live only in Africa and Asia. Hornbills come in various sizes and shapes to match the conditions in their natural habitats. They range in size from the black dwarf (3.5 ounces, 7 inches) to the southern ground hornbill (13 pounds, almost 4 feet tall). 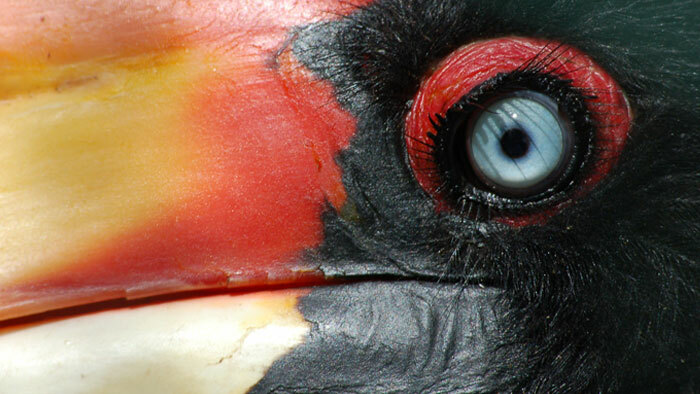 The banana-shaped casque on the top of a rhinoceros hornbill is thought to make its call louder and easier to hear through the dense forest. They all have a casque on the upper mandible that varies from small to large. They have a long heavy beak. They have feather bristles that function like eyelashes to protect their large eyes. The rhinoceros hornbill was revered by ancient people as a “god of war.” Today, it is the state symbol of the Malaysian state of Sarawak. Rounded feathers make flying noisy and somewhat more difficult compared to other birds. The rhinoceros hornbill likes to return to the same area to nest each year, even if the area has been disturbed by human activity. Currently, its status in the wild is considered near threatened due to habitat loss from logging, and from poaching. 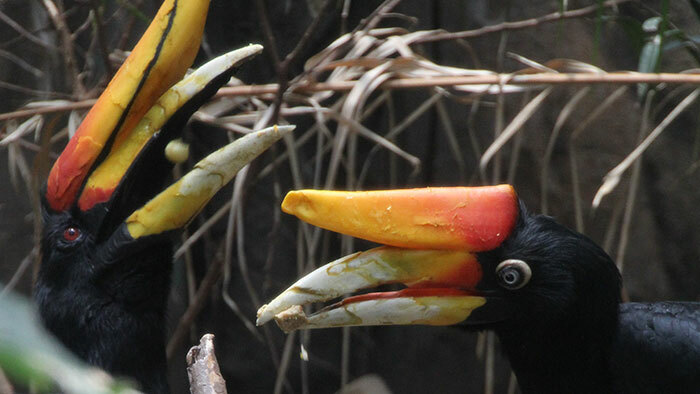 The Minnesota Zoo currently participates in the Rhinoceros Hornbill Species Survival Plan Program (SSP). In coordinated efforts with other zoos across the country, we are working to maintain hornbill genetic diversity and increase successful breeding in the captive population.